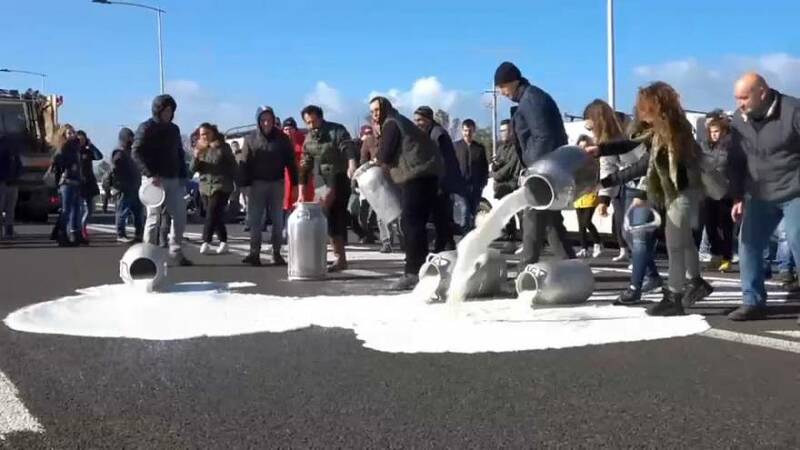 Sardinian farmers and shepherds on Monday continued their protests against low milk prices, dumping thousands of litres of milk from an overpass onto a highway. Producers are currently getting 50 cents for a litre of milk, a price one protester said is the lowest since the 1970s. Monday's protest follows a weekend in which hundreds of protesters dumped milk on highways and threw milk at a milk processing plant. According to Italy's leading farming union, Coldiretti, there are 12,000 sheep farms in Sardinia, each sheep producing 300 kilos of milk per year, most of which is used to produce Pecorino cheese.